A very Birnholzian puzzle today. Letters dropped from wacky, repetitive theme answers all build to a revealer. 23A [Flora’s trousers?] PLANTS PANTS. 25A [Rep of the “With Arms Wide Open” band?] CREED CRED. I really wanted that to be by Journey. Different “Open Arms” song. 41A [Lunch that’s extremely rich in iron, say?] METAL MEAL. Yum. 42A [Harsh critic of a mad tea party figure?] HATTER HATER. 57A [Harsh criticism of Arizona politico Jeff?] FLAKE FLAK. 65A [Payment given to a bridge guardian?] TROLL TOLL. 69A [Male pig in a group of directors?] BOARD BOAR. 95A [Links jinx?] COURSE CURSE. 99A [Do some cuddling in a minute?] SPOON SOON. Awwwww. 110A [Little rascal’s summer destination?] SCAMP CAMP. As usual, I’m impressed by the number of theme answers Evan managed to include while still keeping the grid relatively clean. It’s certainly a theme type he’s comfortable with, and although I’m tempted to say it’s “very familiar,” I also need to remind myself that A) it’s high quality and B) it’s fresh and friendly to the masses. 107A [“Come over here!”] right next to 109A [“Go away!”] was cute. I feel like it’s how I talk to my cat. PSST! SHOO! 33D [Plain text?] ATLAS. 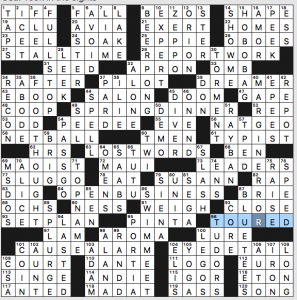 Fun clue. 97D [Mark of Blue Öyster Cult?] Looks like that band has had north of 20 members to date, and no Mark! Clue refers to the UMLAUT over the O. 118A [Thanksgiving dessert] PIE. Indeed. Not too much else to say about this! Your thoughts? 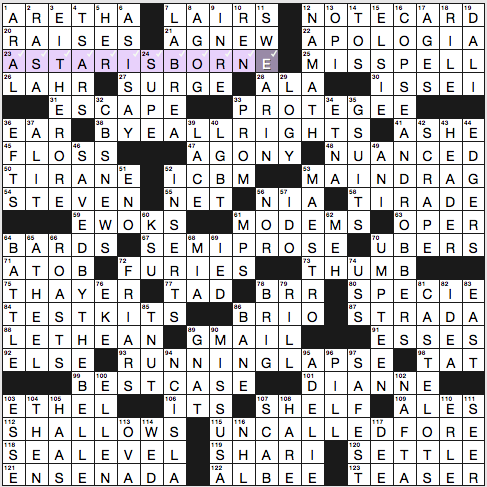 Overall, fun and easy puzzle. And another perfect title. 3.25 stars from me. 23a. [Photo caption for the winning team’s M.V.P. being carried off the field? ], A STAR IS BORNE. 38a. [What you’re effectively saying when you sign a waiver? ], “BYE, ALL RIGHTS.” A key word is repeated in the crosser, 40d. [Human Rights Campaign inits. ], LGBT, but I’m good with a shout-out to HRC, which does some good work. 67a. [Piece of writing that’s half in verse? ], SEMI-PROSE. 93a. [Dropping the baton in a relay race, e.g.? ], RUNNING LAPSE. 3d. [“Hematite, magnetite — take your pick”? ], EITHER ORE. Cute. 16d. [Two things you might find in Sherwood Forest? ], COPSE AND ROBBERS. 81d. [Places for specific social classes to park? ], CASTE LOTS. Cast lots is not a super-familiar phrase. Perhaps draw lots is more common? pannonica or someone else who knows how to do an Ngram search in Google Books can shed light. The theme is pretty solid, though somehow EITHER ORE was the only themer that amused me. Vocab word of the day: 88a. [Inducing forgetfulness], LETHEAN. Related to the mythological river Lethe. Unexpected echo: Albanian capital TIRANE across the way from a TIRADE. I was going to guess that TIRANE TIRADE has been used as a themer in a change-a-capital’s-letter theme, but instead I find that Joon and Andrea Carla Michaels used this capital in an anagram theme, 2010 WSJ TIRANE RETINA. Here’s PuzzleGirl’s review of that puzzle. 53a. [Street through the middle of town], MAIN DRAG. My fave fill. Also good: ARETHA, PROTEGÉE, the SHALLOWS, UMPTEEN. With nine themers, not as much space left for zippy fill throughout. With 1d/2d ARAL RASA, I was primed to pick up on all subsequent crosswordese-ish fill (EFTS, A TO B, yadda yadda). 45a. [Line through one’s teeth? ], FLOSS. I like the clue. 24d. [Apartment building V.I.P. ], SUPE. I think we’ve determined previously that nobody much calls a building superintendent/custodian a SUPE. 13d. [Nail polish brand with the colors Teal the Cows Come Home and Berry Fairy Fun], OPI. I’m a sucker for OPI’s puntastic color names. Got a bottle of California Raspberry on my desk here and that one is not punny! 19d. 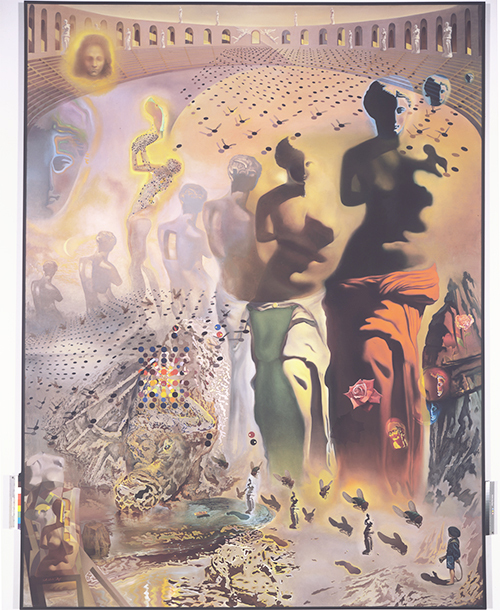 [“The Hallucinogenic Toreador” painter], DALI. If you ever go to the Salvador Dali Museum in St. Petersburg, Florida, do take one of the docent tours. This giant painting has so much going on in it, and you’ll miss a ton if you just look at the artwork yourself. 53a [“Voy”‘s meaning] IGO–cool clue, this! Apparently not used before. Far preferable to the standard FITB’s. I would not have minded a clue without quotation marks even. Maybe [Voy, to Vic]? 72a [Impasse] STANDOFF–I wanted to put STALEMATE in here; then I counted the boxes. 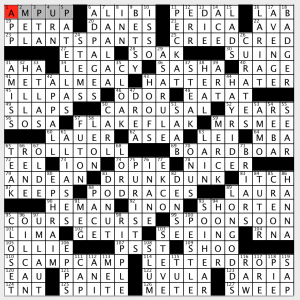 102a [Quotidian] EVERYDAY–This clue is a good word. I should use it more often. But no one around me knows what it means. 9d [German shepherd] ALSATIAN–I need to be reminded of this word from time to time. It is, indeed, a synonym for German shepherd, and is widely used in Great Britain. 12d [Ex-teammate of LeBron] CAV—Hmm. 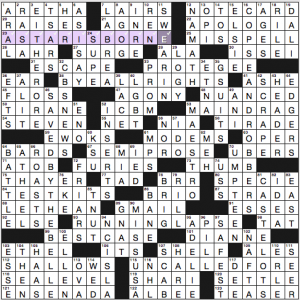 Doesn’t the use of LeBron in the clue signal that the answer is going to be a human being’s first name? 37d [Fairway boundary] ROUGH–Hmm, again. If two distinct pieces of property abut one another, is one said to be the boundary of the other? After looking it up, I think the answer is that, usually, the word boundary refers to a line–or the like, such as a river, or even a forest–that marks where one area ends and another begins. However, it looks like the term “may also refer to the region adjoining the actual line of demarcation.” So, this led to some education, for which I am grateful. 63d [Dog in a Latin warning] CANEM–From this clue I learned that The Cave Canem Demos is a 2012 compilation album by an artist called Voltaire–this while refreshing my memory on “Cave canem,” which is not how we spelled “Beware of dog” in the South I grew up in. 71d [“Moonstruck” actor] AIELLO–We need more vowel-rich names like this, huh? 86d [Moisture-loving maple] BOX ELDER–I did not know about this plant before. 87d [Heaven for a pup?] BELLY RUB–Nice misdirection here. I went first to places. Kudos, Emily and Henry! My rating of 3.5 stars is based on difficulty alone. We have a nice Sunday crossword stroll from Gail. As the title suggests, the “for” is “gone” from each theme answer. Wackiness results. 27a [Horses’ feeding period?] is STALL TIME instead of stall FOR time. 29a [Nightly newscaster’s preparation?] is REPORT WORK. 36d [What may accompany hunger pangs?] is FOOD THOUGHT. Seasonally appropriate. 40d [Result of a faulty tab setting?] is MARGIN ERROR. Margin FOR error or margin OF error? Discuss. 49a [Easter feast, say?] is SPRING DINNER. 63a [“We’re driving around in circles”?] is LOST WORDS. This one doesn’t really work for me. The expression is “at a loss for words.” Google Ngram viewer agrees. 84a [Ticket selling for a major golf event?] is OPEN BUSINESS. 101a [Severe dip in contributions during a telethon?] is CAUSE ALARM. The clue is awkward. I think it’s the result of a dip in contributions, not the dip itself. 104a [Hurricane tracker closeup?] is EYE DETAIL. We’re about to leave to take the returning college student to the airport (sniff) so I’ll skip right to “what I didn’t know before I did this puzzle:” that BLUE TEES are the [Challenging golf hole starting points]. This entry was posted in Daily Puzzles and tagged Emily Cox, Evan Birnholz, Gail Grabowski, Henry Rathvon, Joon Pahk. Bookmark the permalink. It’s the one thing in this puzzle that has me completely flummoxed; please explain! You misspell “physics” if you spell it with an F. Apt for Joon with his background in physics. Isn’t the capital of Albania Tirana? I can’t find any mention of Tirane being an alternate form in Wikipedia – there is a river by that name that runs through the city but the city is unmistakably called Tirana. Googling “Tirane” also leads to a spell suggestion of “Tirana”. My thoughts exactly; if you Google “Capital of Albania” , nine of the first ten entires end in “a”. The tenth lists both. I liked the NYT theme, although it fell for me awfully quickly and I seemed to breeze through. At least I did until I came to the name-heavy bottom: ADELIE, ETHEL, SHARI, HAAS, ENSENADA. I didn’t like that. I thought it meant Silent Final Es, not finale. Exactly. Clever title, on top of everything else. Most of the LGBT people I know loathe the Human Rights Campaign. I honestly had not heard of the HRC, but must say that the article is pretty damning. ….feels contradictory since the E at the end of finale is not silent! Washington Post 33D, “Plain text”=ATLAS. Even after reading Evan Birnholz’s explanation (Think of “Plain” as in the Great Plains and “text” as in a book), I don’t get this. I did have a Rand McNally Road Atlas along on my first long trip on the Great Plains, but does the ATLAS in the answer refer to that kind of atlas? When filling out the puzzle I envisioned missile silos with Atlas rockets in them, on the Great Plains, possibly with “ATLAS” emblazoned on the side that’s visible to passing travelers, but perhaps that’s not the case.